← 20 Presidents at Game On! OK, put yourself in my shoes, and tell me WHAT WOULD YOU HAVE DONE? I was sitting beside my six year-old son on a grassy hill in deep left field during the late innings at a Dodgers-Red Sox spring training game in Vero Beach, Florida. I noticed #5 of the Dodgers signing autographs next to the wall beside first base. I recalled how powerless I felt when, on the plane to Florida, my son said his main goal of this special trip was to”get Nomar’s autograph.” I wasn’t sure how long Nomar had been signing – would he quit in ten seconds? 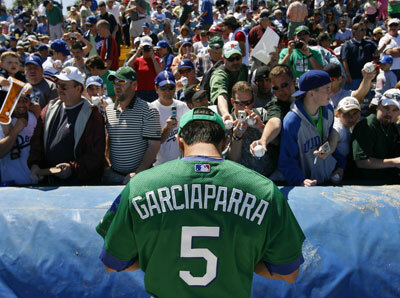 – and the pack of fans around him was large. I knew that if I pointed out Nomar to my son and then he failed to get an autograph, he would be crushed. I knew that if I didn’t tell my son about Nomar being over there, he wouldn’t notice and our pleasant day would continue, undisturbed. Looking across the vast stadium at Nomar, I calculated the chances of getting his autograph at about 10%. WHAT WOULD YOU HAVE DONE? When we got to the top of the aisle leading down to the wall where Nomar was signing, we saw that the crowd of fans around him was about fifteen people deep – 80% of them adults. It was a pseudo-line, yet it was obvious that the people at the back of the pack would stay at the back of the pack and go away disappointed. WHAT WOULD YOU HAVE DONE? “But Daddy, that’s cutting,” he said. (What a good boy.) It was time to teach him about the cutting exception. And off he went. Slithering better than a snake could slither. I don’t think he touched anyone on his way to the front, right in front of Nomar, where he thrust his glove towards Nomar’s belly button (see left). Nomar handed a hat back to a girl, adjusted his sunglasses, looked at the outstretched arms before him, smiled at my son, then took his glove and signed it with his blue Sharpie. Rob – You’re the best – your song, video, and blogs epitomize a true Red Sox President!!! !